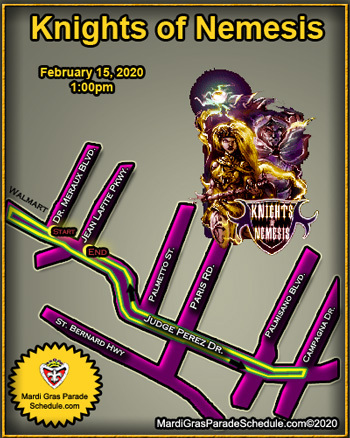 The 14th Annual Knights of Nemesis Parade will take place on Saturday February 23, 2019 at 1:00 PM starting at the St. Bernard Civic Center and following the traditional St. Bernard parade route. Nemesis expects to put 27+ floats on the street with 50 plus marching units. On May 17, 2004 a group of one time members from the Krewe of Gladiators and several long time carnival parade riders came together and formed the Knights of Nemesis Social Club and Parade. The Knights of Nemesis mission is to become "A businessman's social club with the intent to promote business and fellowship within St. Bernard Parish." To achieve this goal monthly socials will be held on the second Monday of the month rotating the location to different business establishments throughout the parish. In Greek mythology, Nemesis was the goddess of retribution. She is either the daughter of Nyx (the goddess of Night), or the Titans Oceanus (the god of the ocean) and Tethys (as the goddess of fortune). The poet Hesiod makes reference to the power of some other daughters of Nyx, including the Fates. The Fates were known as handlers of the threads of life. Clotho was the spinner, determining the time of birth; Lachesis was the drawer of lots, determining the length of life; and Atropos was the cutter of the threads that represented the inevitable end to life. If the Fates were resisted, the goddess of justice, Nemesis, determined the outcome. Nemesis directed human affairs in such a way as to maintain equilibrium. Happiness and unhappiness were measured out by her, care being taken that happiness was not too frequent or too excessive. Along with Dike and Themis, Nemesis was one of the assistants of Zeus, who was regarded as the founder of law and order. Nemesis sometimes appeared as a winged goddess. In her left hand she held an apple-branch, rein, lash, sword, or balance. Her attributes were like those of Tykhe: a wheel and a ship's rudder. There is another aspect to the tale of Nemesis, and that was her role as one of the many paramours of the god Zeus. According to one source of the legend, Zeus (who was always fond of beautiful females) became enamored of the goddess. However Nemesis wanted nothing to do with him. 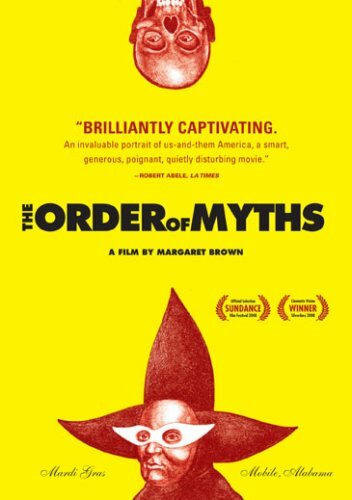 She tried to flee from the god's unwelcome advances by transforming herself into a series of fish and animals. Finally, Zeus caught the object of his affection in the form of a swan while Nemesis was in the guise of a goose. In these shapes the pair mated, and as a result Nemesis later laid an egg from which the famous beauty Helen of Troy was hatched. There are also indications that Nemesis was patroness of gladiators who fought in the arenas with the wild beasts during the imperial times and was also worshipped at Rome by victorious generals.